Ten miles north of Caithness on the northern tip of Scotland lie the Orkney Islands, a group of 70 unusual and enigmatic islands, of which only 20 are inhabited.. by people at least. Orkney has been home to various peoples for at least 5500 years, and what makes the Orkney Islands so remarkable is that, owing to its lack of trees,(deforested in prehistoric times) the stone houses that these ancient people built are still in existance. More than mere huts, they are elaborate dwellings, and tell a story that goes back into pre-history. First inhabited by neolithic tribes, then the Picts, the Orkney Islands were finally annexed by Norway in 875. 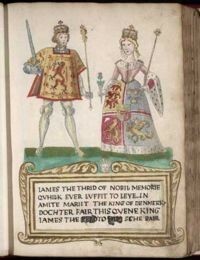 Not until 1472, after the failed payment of a dowry by a King of Norway,(his daughter Margaret was betrothed to James III of Scotland) were the islands returned to Scotland. The Orkney Islands are well worth the journey, not just for these prehistoric sites, over a thousand of which have been discovered there, but for its dramatic history, scenery, diving (in Scapa Flow) and wildlife. From May to mid-July it is a bird watchers paradise, and thousands of seabirds including fulmers, puffin, guillemot, razorbills and skua nest there in reserves watched over by the Royal Society for the Protection of Birds. The largest island is known as Mainland (a corruption of the Old Norse 'Meginland')and is the sixth largest Scottish Island at 202 square miles. 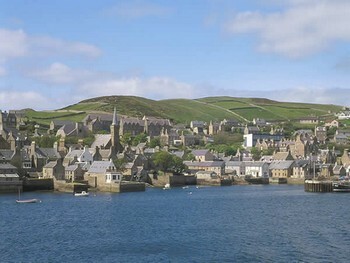 Kirkwall is the largest town,(75 percent of the population live there) which also has the main airport. Operated by Highlands and Islands Airports, Loganair provides flights to the main cities on the Scottish mainland as well as Shetland. Car ferries also run between Orkney and the mainland. 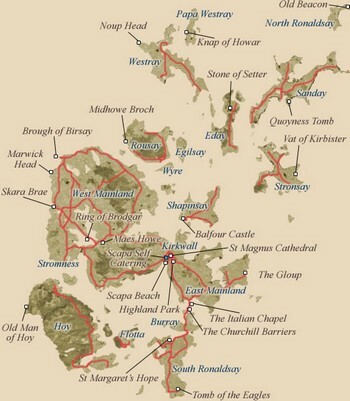 Here is a map to show you the layout of the islands and the main points of interest..there are many! Many of the most ancient and best preserved neolithic sites are located on Mainland including the Ring of Brodgar, the Tomb of Maeshowe and the famous ancient village of Skara Brae. Skara Brae was buried by moving sands for 500 years. In 1850 a violent storm uncovered the structure and its astonishing and elaborate contents including stone age beds, kitchens and dressers. 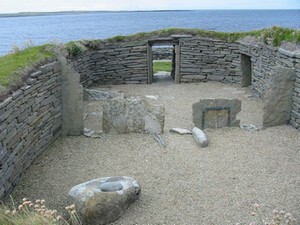 Europe's oldest house at 5000 years, is located on the Island of Papa Westray. 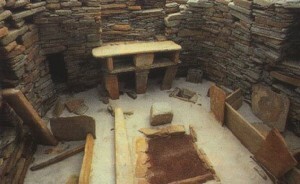 Radiocarbon dating shows that it was occupied from 3500 BC to 3100 BC, earlier than the very similar houses in the settlement at Skara Brae. In case you were wondering if there is any modern accommodation on Orkney, don't worry, there is plenty! There are many bed and breakfast establishments in Kirkwall, and places to eat, including the Kirkwall Hotel and the Ayre Hotel, both of which have nice restaurants. All this sea air will definitely make you hungry! 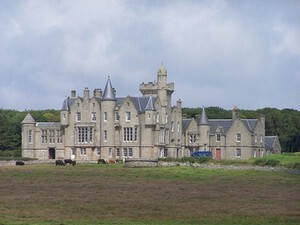 On the island of Shapinsay there is the baronial Balfour Castle Hotel, billed as the most northerly castle hotel in the world. This castle takes its name from the Balfour family who dominated the culture of Shapinsay during the 18th and 19th centuries. It makes for an extremely romantic location for a wedding and is accessible by ferry from Kirkwall. 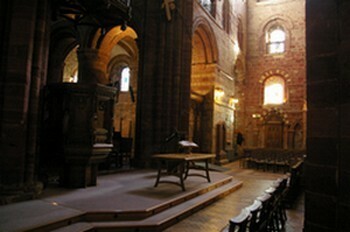 While you are in Kirkwall, the magnificent St. Magnus Cathedral is an architectural wonder that you must see. It was built from red and yellow sandstone, and is 860 years old. In June every year, it hosts a week-long festival of classical music. Some of the smaller islands have barely any people on them at all. Gairsay is populated by one family..who issue their own postal stamps, an unusual privilege, bestowed on them simply because of the lack of accessibility by the Royal Mail. Auskerry has a population of five (at least according to the 2001 census)and is a favourite nesting place of the Arctic Tern and the Storm Petrel. Wyre has the oldest castle, Cubbie Roo's castle (dating to 1150) and at the most recent count, a population of eighteen. Sanday is the largest of the North Isles and has a population of five hundred..quite crowded by Orkney standards. 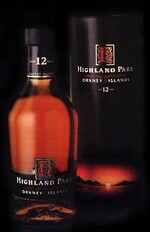 The world's most northern distillers at Kirkwall is called Highland Park and has been in operation since 1798. It is said that both the King of Denmark and the Emperor of Russia declared it to be the finest whisky they'd ever tasted! 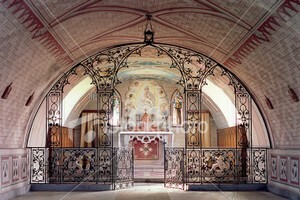 Another beautiful piece of architecture in the Orkney Islands is the Italian Chapel built on Lamb Holm (Holms are the tiniest of the islands) by Italian POW's captured in Africa during WW11. The prisoners were stationed there between 1942 and 1945 to help to construct the Churchill Barriers at Scapa Flow. These barriers were constructed on Winston Churchill's orders, built after the sinking of HMS Royal Oak by German U-boats in 1939, to protect Scapa Flow, a natural harbour. Scapa Flow is now very popular with Scuba Divers, owing to the number of accessible wrecks on the sandy sea-bed. One thing to remember when visiting the Orkney Islands is that the summer nights at this latitude are almost endless..and the same applies to the dark winter nights. So from May to October, you will have plenty of hours of daylight to explore. 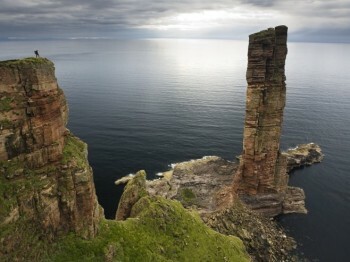 For more about the legends and history of the Orkney Islands, and there are some wonderful customs which are still carried out to this day, visit the definitive Orkney Islands website www.orkneyjar.com. 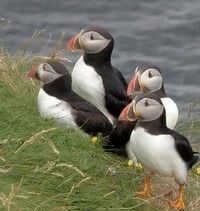 Orkneyjar.com is a privately-run, non-profit website, created and maintained by Sigurd Towrie, a resident of Orkney. I wish you many happy hours on these most fascinating of isles..